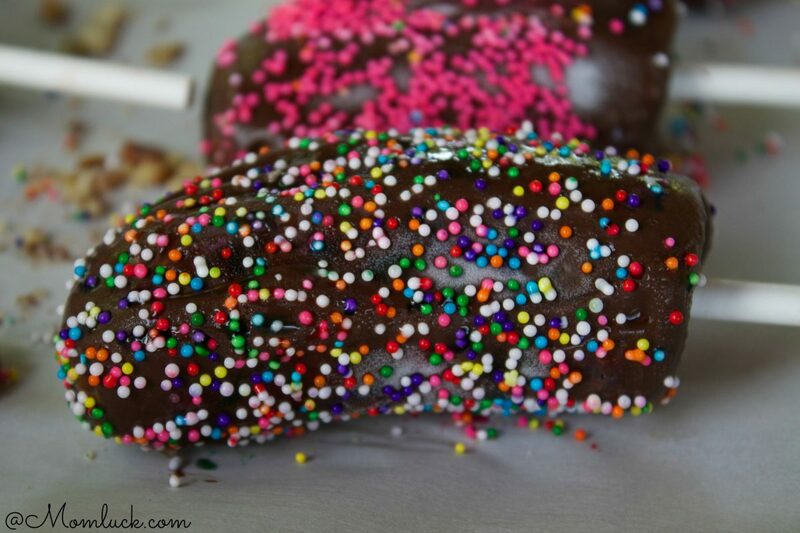 These chocolate covered bananas are not only super delicious but they are easy and fun to make. Here in Oklahoma, summers can be brutal and each year it becomes a challenge to find new ways to help us stay cool. One thing I know for sure that will never fail is a frozen treat. Well what if I told you that you can have the Best summer frozen treat covered in chocolate with little effort. Various toppings such as sprinkles, almonds, pecans, etc. 1. Cut your bananas in half and insert a stick in the bottom that goes about half way up the banana. Lay your bananas on a cookie sheet lined with parchment paper and freeze for 3-4 hours. 2. After your bananas are frozen. Put the chocolate chips in a microwave safe bowl and microwave on high until melted around 1-2 minutes. Stir every 30 seconds. 3. Take the chocolate chips out of the microwave and add the oil. Stir well. 4. 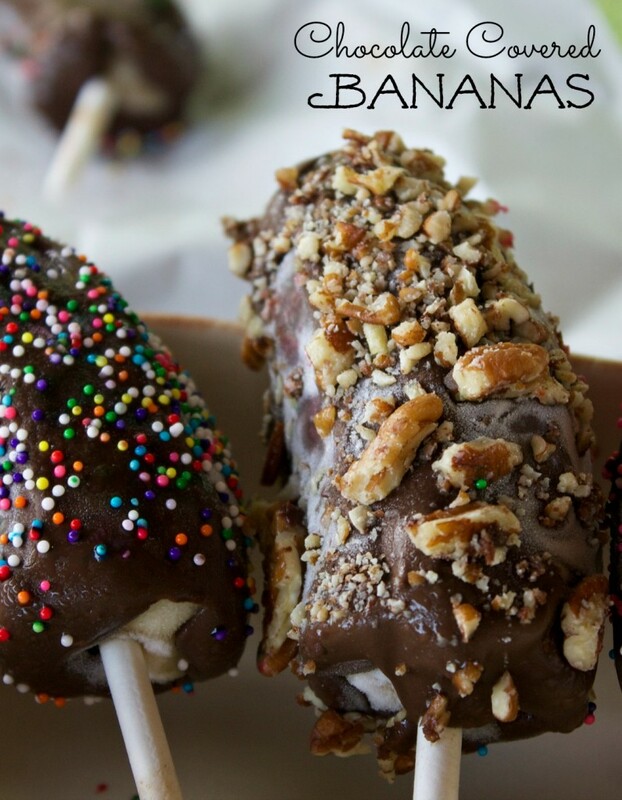 Take the bananas and dip them into the chocolate mixture until the entire banana is coated. Immediately add your toppings and lay the banana back on the cookie sheet lined with parchment paper. 5. Place the bananas back into the freezer for about an hour or until you are ready to eat them. This is probably one of my favorite summer frozen treats. This is also a fun activity to do with your kids. Although I will warn you that the chocolate part does get a little messy but that’s just all part of the fun. Right?! 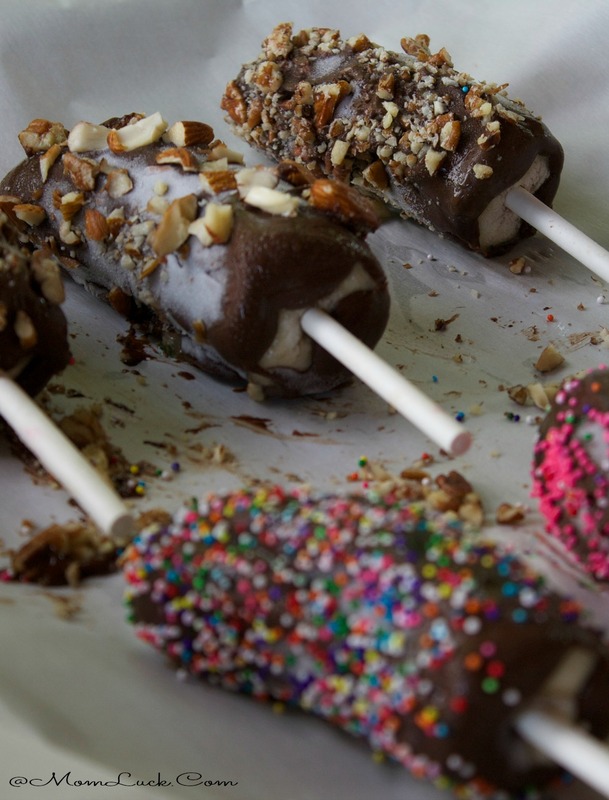 What’s your favorite topping on Chocolate Covered Bananas?